for the Long Beach Bach Festival, which he founded in 1973. Dr. David Wilson, a professor of choral music at USC, succeeded Frank Allen and led the choir for over twenty years, expanding the Camerata Singers’ repertoire and changing its name. CSULB choral director Dr. Jonathan Talberg was appointed artistic director. He added a core of professional singers to the ranks and led a second European tour in 2006. The 2017-18 season marked the introduction of the choir’s newest artistic director, Dr. James K. Bass, professor of choral studies at UCLA and Associate Conductor of the professional chamber choir Seraphic Fire. Currently in its 53rd season, the Long Beach Camerata Singers presents the Camerata Peace Project in the fall, a December performance of Handel’s Messiah, and a June concert entitled “Evening of Song.” ChoralFest Long Beach, our spring multi-event choral festival, takes place in the March/April period. Camerata has performed with other arts organizations, including Musica Angelica Baroque Orchestra, the Pacific Symphony, the Long Beach Opera and the South Bay Children’s Chorale, the Long Beach Youth Chorus and as the Artistic Partner of the Long Beach Symphony Orchestra. The chorus’s education program, the Camerata Kinder Konzerts, provides interactive learning experiences focused on the vocal arts. 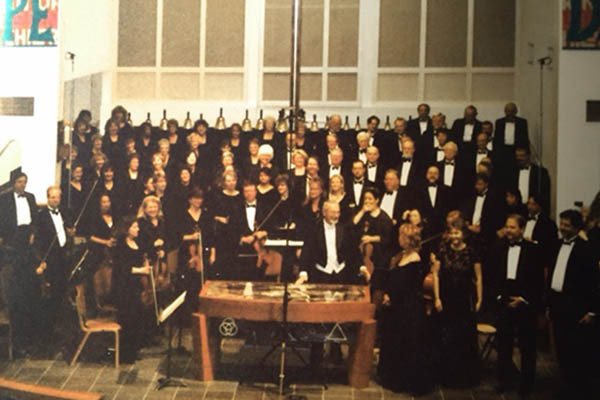 Under the baton of Dr. David Wilson, the chorus first toured Europe in 1999. From 2009 to 2017 Dr. Robert Istad, director of choral studies at CSU Fullerton, led the choir as its artistic director, expanding the auditioned ensemble to 90 voices and raising the group to the professional level for which it is known today.